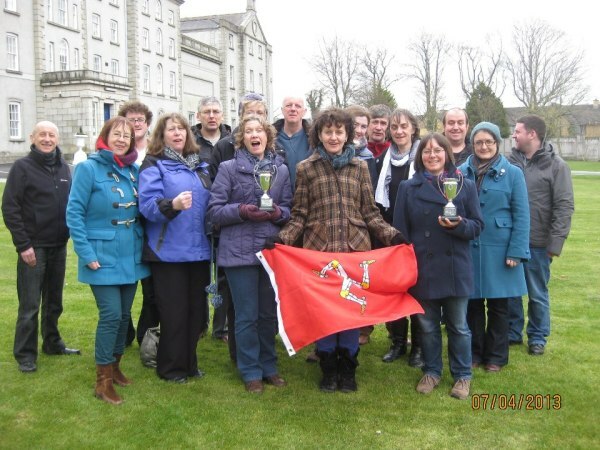 Manx Gaelic choir Caarjyn Cooidjagh received transport and accommodation funding from Culture Vannin to enable them to attend the Pan Celtic Festival in Carlow, April 2013, where they took part in three choral competitions and gave a number of performances. The Caarjyn had fantastic success, coming first in two out of their three choral classes and beating top choirs from Wales, Scotland, Ireland and Brittany, firmly placing Manx traditional music on the Celtic map. Annie Kissack, musical director, composer and arranger of Caarjyn Cooidjagh's repertoire is delighted with her choir's achievement. "The Pan-Celtic Festival is the biggest competitive event for Celtic music and I am thrilled that Caarjyn Cooidjagh has been so successful. The choirs we were competing against are of an amazingly high standard and I am pleased that the Manx have been recognised at this level. We don't normally enter competitions so I'm really surprised but delighted with the outcome". Annie first competed in a new song competition at the festival 40 years ago. Caarjyn Cooidjagh was praised for the technical competence, energy and passion of their performance. Caarjyn Cooidjagh can be heard online by following the link.